Every year, NeoGAF has a 50 books and 50 movies challenge, in which you have to read 50 new books and watch 50 new movies before the start of the next year. There is also a game equivalent, in which you have to beat 52 new video games. These challenges provide that extra motivation to do/finish the things you already wanted to anyway and can lead you to checking out stuff you otherwise may not have (this is especially true with books). The movie challenge was the only one I completed, watching a total of 58 throughout the year of 2016. My ratings are done on a 5-star scale (no halfsies). I should be able to complete the movie challenge again this year, though I will give more time to reading books in 2017. I got pretty close to completing the challenge, but ended up eight movies short. Microsoft had an awesome sale near the end of the year where you could rent new releases for only ten cents, which helped me get a lot closer than I otherwise would have. I'm not very critical of most of the media I consume, so it's not often I give something less than three stars. Completing the movie challenge in 2016 is almost a sure thing, as I've already seen 40 so far. Then maybe I'll spend more time reading books! Let's snort powdered sugar and play A Night at the Roculus for the Oculus Rift DK2. Nod your head in rhythm to Haddaway's "What Is Love" and get the highest score possible without straining your neck. No Chris Kattans were harmed in the making of this video. A Night at the Roculus is made by Holden Link and Nic Vasconcellos. Join me as I see just how deep the rabbit hole goes in The Matrix VR, an Oculus Rift demo that allows you to experience select key moments from the original film. Check the timestamps below to jump to the different gameplay segments available. The Matrix VR is made by Tipatat Chennavasin, Eric Beyhl, and Jon Dadley. On this fateful day 17 years ago, Randy Quaid flew his jet into the alien destroyer, sacrificing himself to save countless American lives. May he be remembered not as a drunken crop-duster, but as a hero. I thought this was kind of funny. I clicked on The Amazing Spider-Man ad that's currently on the Xbox 360 dashboard and was greeted with a small clip of Andrew Garfield, the film's star, promoting the film for Xbox Live. These promotions always seemed like one of the worst parts of an artist's job, be it an actor or musician or something else, where the interviewer wants the interviewee to record a quick clip or sound bite of them mentioning the service the interviewer works for (like a radio station or Video on Demand channel) or, in some cases I've seen, the interviewer's personal website/podcast. In my experience, it usually comes off as disingenuous, and understandably so. It's even worse when you know that artist has never heard of the thing they're promoting! Anyway, no ill will toward Andrew. I just thought it was amusing. He could also just be really, really tired. Press tours can be pretty grueling. There wasn't any particular reason for me to feel that way; it was just a feeling. After a little more research, I found Facebook pages for various casting agencies in the North Carolina area, which seems to be their main way of posting job info. I created a Facebook account - after a year of not having one - to follow the pages more closely and researched how to apply for roles properly. Four days later, on the 15th, I had gotten a role as an extra on Revolution, and then, on the 20th, I got a role on We're the Millers. I'll be writing and releasing separate posts for these and any more of my acting experiences as the movies/shows come out. My only prior experience with acting is doing three musicals during my time in middle school and taking a drama class in high school. The first two musicals were at the Junction City Little Theater in Kansas, while the final (and worst) one was at Fort Riley Middle School. Only the first play I did, Kilroy Was Here, was any good. I'll write more about these sometime in the future. Of course, acting in a musical and doing background acting are completely different things, and I'll soon be going into more detail on just what a day as an extra can be like. While this isn't something I'm currently interested in making a career out of (not that I could in North Carolina), I will be taking as many opportunities for background acting as I can. It's a fun diversion that pays well and gives a cool story to tell. Plus, the food is always free and delicious! 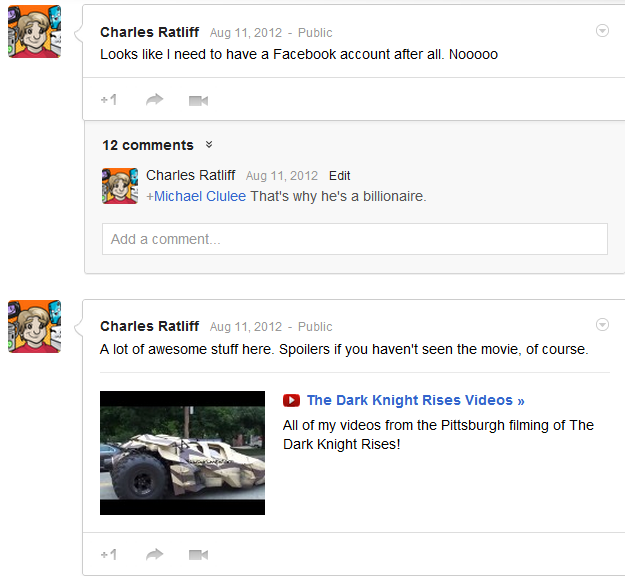 A couple of the Google+ posts I made that day.